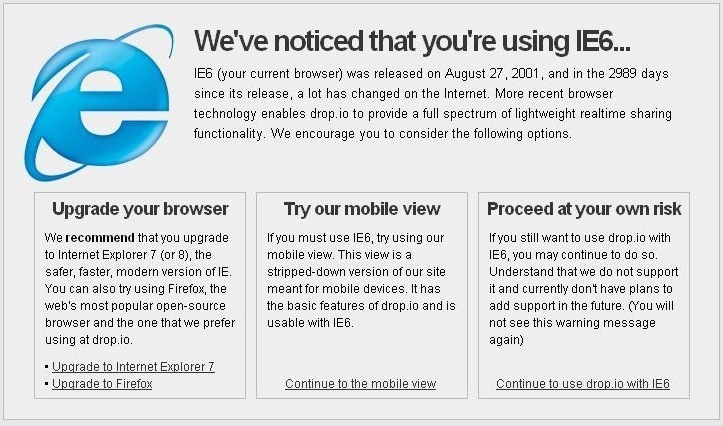 I need to use IE6 for some internal applications at work. I have Firefox installed for regular Internet usage; occasionally I attempt to use the Internet with IE6… messages such as this are becoming pretty common now, but this one made me laugh. The gist is: please use anything but IE6. This entry was posted on Monday, November 2nd, 2009 at 17:33 -0500 and is filed under technology. You can follow any responses to this entry through the RSS 2.0 feed. You can leave a response, or trackback from your own site.